My kneading muscles (who knew that was a thing) are out of shape! Monday I spent most of the day making delicious rolls. I think this was the first time I’ve ever made rolls myself, although I’m sure I’ve been around when my grandma or mom made them. It’s definitely not a quick process, but it was very satisfying. I made two recipes (not a double because they need space to rise, so I had two separate doughs going at the same time) which worked really well. If you’re going through all the effort and time you might as well get twice as much out of it! I was also able to try one recipe with white whole wheat flour, and one with regular all-purpose flour. They were both delicious (I didn’t notice much of a taste difference), the all-purpose flour were a bit fluffier/bigger, so use whatever is on hand and convenient for you. I followed this recipe, but without any special equipment (like a thermometer or a plastic bin for the bread). Mix the bread flour, white whole wheat flour, and yeast in a large bowl. Make a well in the center and pour in the water and melted butter. Stir until combined. 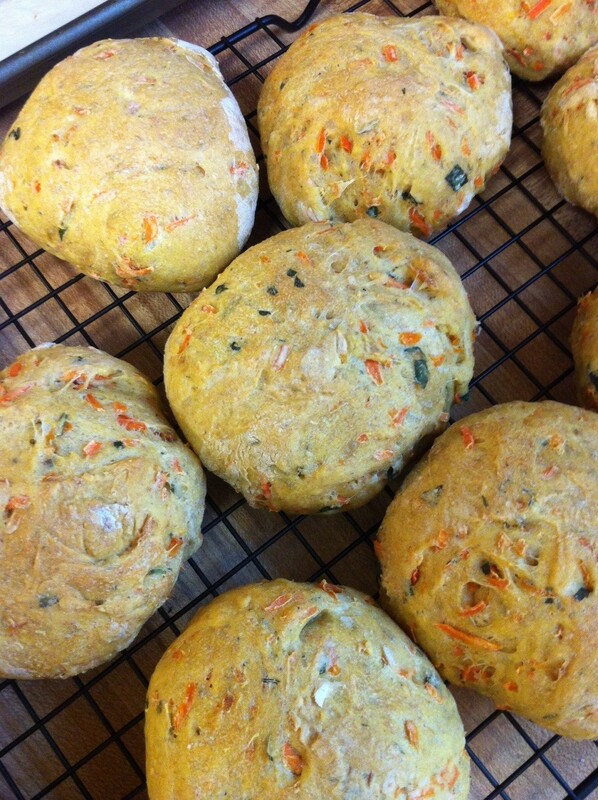 Mix in the carrots, parsley, rosemary, and thyme and stir until a soft sticky dough forms. Turn dough out onto a well-floured surface and knead 5 minutes, sprinkling on a little more bread flour if necessary to keep the dough from sticking to your hands and the work surface. Cover the dough with bowl and let rest 20 minutes. Sprinkle the salt over the dough and knead for another 5 minutes until the salt is fully incorporated and the dough is smooth and still slightly sticky, adding more flour if necessary. Put the bowl in a large, warm, greased mixing bowl covered by a damp towel (just damp enough so that the dough won’t stick to the towel). Let dough rise until doubled in size about 1 to 2 hours depending on how warm your kitchen is. Once the dough has risen, punch it down and turn it out onto a lightly floured surface. Let rest 10 minutes, then divide into 16 pieces. Press down on each piece to expel any air bubbles, then shape into balls. Place rolls on parchment paper covered baking sheets, cover with a towel and let rise until double in size, about 45 minutes. Just before placing rolls in oven brush on a little salted water for a light shine and crisp baked crust. Bake until tops are golden brown and the bottoms ound hollow when tapped, about 25 minutes. Cool on a wire rack. Store in an airtight container or freeze. If desired, reheat at 350°F for 5 to 10 minutes before serving, this will crisp the crust up again. ← Pumpkin is delicious any time of year!